After a long drive from Bronkhorstspruit (50 kilos from Pretoria) we were very surprised by the friendly welcome we received from Colin and Lee Howard from Bretton Beach Crest. Our stay was excellent and we enjoyed the view and saw some whales while we were sitting on the stoep. My husband had a bypass and that was just the thing he needed to rest and relax. Every thing we needed was there and the cottage were very clean. As it was our first time in the Eastern Cape we explored quite a lot. Thank you very much, we will definitely recommend Bretton Beach Crest to our family and friends. My husband and I (and the kids of course!) would just like to thank Lee and Colin for the perfect holiday we had at Bretton Beach Crest!!! The place is wonderful and our view was stunning!!! In our 17 years of marriage, we decided, THIS ONE was our best holiday ever! We visited Bretton Beach for the first time December/January. We found that the accommodation was excellent for what you paid for. The rates were very reasonable and fair. The dustbins are service every day and there is a maid facility on requests at a very reasonable rate, which makes the stay even more relaxing. The cottages are so well spaced that you have absolute privacy. The setting in bush over looking the sea gives you the best of both worlds, and the bird life is stunning. The beach is only 5 mins walk away. We were able to see 5 whales breaching from our porch which was the highlight of the visit. Colin and leigh are exceptional hosts and they are honest. What I appreciated the most was that I had paid for one extra day but decided to leave early and I did not expect a refund, but got one. Highly recommended in a secure and quiet setting and is suitable for all ages. I stayed at Bretton Beach for the entire month of February and had a wonderful time. The cottages are clean, spacious and very well appointed. I only had to bring towels as everything else is provided. The cottages are in a very peaceful location with stunning ocean views and are suitable for both families and couples. Bird life is abundant in the area and it’s a great base for exploring the surrounding Eastern Cape. The owners are very friendly and happy to help with any queries you may have. I’m already looking forward to returning next year for another long stay. Vir die afgelope paar jaar gaan ons graag met vakansie by Bretton Beach. Vir ons wat klein kinders het gee dit vir ons so bietjie tyd af van die dolle gejaag van die allerdaagse lewe. Met geen paaie/verkeer om die huisies is daar nie die alewige bekommernis dat een van die kids omgery gaan word nie. Die strand is sigbaar en slegs ‘n kort afstand van die huisies. Die groot see swembad op die strand is seker die grootste trekpunt vir die kinders en geniet ons almal die tyd in die water sowel as op die strand. Die huisies is ten volle selfsorg (met opsionele skoon maak dienste), heel eenvoudig, maar gerieflik. Weereens geen bekommernis dat die kids die plek gaan afbreek nie. Rus en vrede vir ‘n moee mamma en pappa. Thank you so much for our cottage with a R1 million view! We really enjoyed our stay – it was like having a secluded island of our own. Ons was al verskeie kere by hierdie vakansie-oord en dis elke keer die moeite werd. In hierdie rustige atmosfeer kan jy nie anders as om net te rus en ontspan nie. Sal altyd weer terug gaan! Upon arriving at our destination I turned to my brother and said: “It’s nice to finally be home”. After going to Breton Beach Crest for 21 years (me only being 21 years old) it has definitely become a home away from home with a friendly little whale beckoning you in; and welcoming you back. Bretton Beach Crest is a refuge from the hustle and bustle of everyday life, a serene setting situated in cultured Port Alfred on the Sunshine Coast where one can easily relax and restore your weary body and soul – and so close to the beach you can almost hear the sea knocking on your front door! Bretton Beach Crest is not only a place to relax, but offers many delights to the adventurous at heart. One can spend hours investigating the rock pools, playing on the beach with your family or walking along the romantic shores as the sun sets in a pink haze. Other adventures include, for instance, boat trips on the Kowie River, surfing on East beach, horse riding, fishing, deep sea fishing and even snorkelling or diving – just take a look inside the helpful guide placed in every cottage at Bretton Beach Crest to get you started. Bretton Beach Crest is the best example of the popular term: ‘location, location, location.’ It is situated at the edge of town, but at the same time only a stone’s throw away from the town centre and the new Rosehill mall, making trips to the supermarket effortless. A sense of privacy is created with the indigenous bushes surrounding the cottages and paths that lead to the beach. Every cottage has a beautiful view of the sea or is placed so as to have one by taking just a few steps outside. The cottage we visit every year, for example, now has a bench placed at its lookout over the sea, built by the caring and goodhearted Colin and Lee Howard- owners of Bretton Beach Crest. Bretton Beach is a lovely private beach with cool tides and beautiful dunes. There is also a tidal rock pool on the beach (called the ‘kiddies pool’), where children can spend their days investigating the sea life and swimming safely. As I walked past it today I felt sad that I am too grown up to be able to splash around in that little pool. The towns blue flag beach, Kelly’s, is also any teenager’s dream, with lots of people, hotdogs sold on the side and wonderful swimming conditions. The cottages themselves come equipped with everything you could possibly need. Comfortable beds and chairs, dining space, kitchen, a television (which we seldom use because Port Alfred in itself is much to entertain), enough closet space for the whole family and all the other essentials. The design of the lovely little cottages reminds me of a fisherman’s house, complete with little stoep and braai area. We have spent hours on the stoep, braai-ing and chatting the night away, listening to the sound of the waves crashing, with the flames of the fire dancing in the background. If braai-ing or cooking is not your forte, Port Alfred offers some fantastic culinary experiences. The Bretton Beach Crest guide is, again, a good place to get a glimpse of what is available, but I feel the best way is to take a drive around town and strategically plan your way through all the breakfast, lunch and dinner places – as you will definitely want to try them all! The nightlife in Port Alfred is vibrant: even though there are not a multitude of places, quality has clearly been valued over quantity. I, a 21year old, seldom find myself without something to do after 8 in the evening. Bretton Beach Crest is a place of absolute tranquil relaxation and indulgence in the enjoyment of life. Every holiday spent here as a child, teenager and now young adult has been a wonderful experience. Every year I pack my holiday bags gleefully in anticipation of going back to the place that has become our home away from home. 2 Weeks of absolute bliss. Friendly hosts, fantastic views, convenient proximity to shopping centres, etc. The list goes on. The tranquil atmosphere was only disturbed by the old biplane from 43 Air school looping overhead now and then. Their air show was only one of the many things to see in the area. Our children disappeared around 8 in the mornings only to be seen again when they got hungry. Bretton Beach Crest will undoubtedly see us again. We wish to thank Colin and Lee for the most unforgettable time in “our” cottage. I really can’t tell you how much we enjoyed staying there!!!! Everything was just perfect!!!! The only problem is that we should have stayed for our entire holiday!! You will definitely see us next year. I will send you a photo of the fish we caught. Many thanks again, you are two lovely people and we are very privileged for sharing your place!!! Take care and God Bless!!!!!!! What a piece of heaven on earth you have there!! We completely fell in love with Port Alfred and your cottages setting, nothing but the sound of the waves and birds song. Thanx for making family holidays affordable, first time we could actually afford beach front accommodation. We all had a blissful time & can’t wait for our next trip. We can highly recommend Bretton Beach Cottages. We had a most relaxing time at the Bretton Beach Cottages despite the stormy weather outside. The cottages are nicely secluded and shielded by greenery, have marvellous views of the ocean and we were happy to find the cottages well-equipped and spotless. We thoroughly enjoyed the lovely surroundings and the pristine beach. Thank you for your kindness and hospitality! Hopefully we can someday return for a break-away weekend! Thanx a lot for a fantastic stay at Bretton Beach no 3. The view is so beautiful. All the cottages is peaceful, still and have a nature atmosphere. Just a quick note to say how much we enjoyed our stay at Bretton Beach. You are so lucky to live in such a beautiful part of the country! Thank you for the stay at Bretton Beach Cottages. We loved it there, we had such a great time, and will make a point of it to come back every year! And to top it all off, every morning you wake up to sound of the waves!! Thanks yet again to Colin and Lee for another perfect stay in Port Alfred! Both Axel and I loved our stay with you in Cottage 2. The setting and seclusion are second to non and the cottages have everything you could wish for. The only noise you can hear is the sound of the ocean and it’s the perfect holiday spot for couples and families. The cottages are in a safe and very secure area and the surrounding natural beauty and wildlife are just stunning. It will always be my home from home every time I visit. The warm welcome and hospitality plus all the local knowledge that Colin and Lee have mean that you will get the very best not only from Bretton Beach but also the surrounding area. It is the most beautiful and welcoming place. Thank you! Thank you very much for accommodating us. We really recommend Bretton Beach Crest for anyone who wants to escape the rush of city life. The cottages have everything that a person needs. You are so close to nature and wonderful bird life. You hear the sea when falling asleep and when you wake up. Probably one of the nicest places to stay along the Sunshine Coast. Excellent value for money, comfortable, with amazing views over the ocean and friendly owners. You actually feel like you’re in your own private little nature reserve, surrounded by the dunes and mikwood forest. Can’t wait to get back. Well equipped, clean and affordable. Wonderful views and close to the beach. Highly recommended for a short or long stay. Where Relaxation goes to take a break! Imagine the difficulties posed by taking twelve teen-aged boys away to the coast for a week on a sport’s tour with a limited budget. For the past six years I have done exactly that. We attend the annual school’s boat race every December and every year I make the same arrangements. After all, why change something that works. Bretton Beach Crest has hosted us for the past six years and, as long as I am in charge of our club, will continue to host us for the ongoing future. As a rowing coach, I have a serious requirement to provide an environment that facilitates relaxation and removes distraction. Comfort of my athletes is of extreme importance, as is their ability to shower and constantly feed themselves. Logistics are important to me as a coach. Access to the shops and the river should be easy. As an educator, I have a requirement to keep my students safe, to ensure that their activities are not interfering with anyone else’s and to constantly engage their minds with the acquisition of knowledge. As a parent and an adult, I have a need to ensure that the children in my care are happy and are enjoying themselves. They need to be entertained and need to feel comfortable enough to include me in their activities and also be able to find their own space. Bretton Beach Crest satisfies all my requirements. The cottages and their sensational setting in the dense vegetation on the beach dunes, provides a connected isolation which is exceptionally conducive to relaxation. You simply have no choice but to unwind and relax. The shaded road and walkways, the magnificent sweeping sea views, the wild un-spoilt beaches and the never ending sound of waves crashing on the beach are an absolute tonic and invigoration for anyone. To have such a large group of diverse teenagers in one place and yet never have an issue arise between them speaks volumes for the amount of space and the range of activities that are available. Whether they are walking on the beach, relaxing on their beds, playing cards on the veranda, looking out for wildlife under the shaded canopies or simply sitting atop a dune taking in the sea view, the boys never feel as though they are on top of one another. Don’t get me wrong, this secluded paradise is so easy to access from the town and so conveniently situated that it adds to my stress relief. Nestled perfectly between the new shopping center at Rosehill with its commercial luxury of Spar and Woolworths and the center of Port Alfred, everything I need is simply a mere five minute drive away. Colin and Lee Howard, the owners, have over the years become friends and continue to take pride in the accommodation that they offer. Their hands-on supervision of the premises is unobtrusive yet effective and lost keys or requests are efficiently dealt with in a friendly manner. The cottages offer just the right balance of comfort and rural charm. Every-thing you need is present. My athletes sleep well at night and I have never had a boy complain of being stiff or sore after a night’s sleep. This is quite an accomplishment and certainly a testimony to the quality of the beds provided. I sleep well at night too. Knowing that my students are comfortable and relaxed, knowing that I can simply allow them to spend time on the beach the next day and knowing that they are secure and safe allows me the opportunity to rest easy. The annual boat race has become a personal highlight for me every year. It is an opportunity that I get to personally relax but also to have a group of boys that are so comfortable that they give me the opportunity to get to know them better. I would be remiss if I only sung the praises of Bretton Beach Crest. Everything has a down side. Every year I have to leave and it is with a heavy heart that I pack my bags on the last morning. Somehow, there is a small consolation as we load our bags and one or two of the more junior boys catch my eye and smile. We know! We’ll be back next year! It is not often that one stays in a place that is a truly pleasant surprise. We were quite anxious that paying R350 a night we could not expect much. It was quite the opposite: a cottage with a spacious verandah and a lovely sea view, spotlessly clean although simply furnished, everything that one would need in a kitchen (and more), a supply of fresh drinking water and a great cold outside shower. The cottage was set in the natural dune bush so there was total privacy which was surprising as there are 9 cottages. Once again we had an awesome stay, the cottage was perfect and the view was just what we needed. Our kids kept us busy on the beautiful beach and dunes. I would just like to thank you once again, everything was perfect !!!!! It’s more than worth the long trek from the UK to come and stay at Bretton Beach as often as possible. The stunning location and the beautiful and private cottages are the best that I’ve found anywhere in South Africa. Colin and Lee are wonderful hosts and are happy to share their local knowledge. The cottages provide a total escape and are equipped with absolutely everything you need for a comfortable stay. The value they offer is amazing. If you’re a single traveller, a couple or a family this is a perfect place to come to. I always leave with a heavy heart but then start looking forward to my next visit! We have had a wonderful week end at Bretton Beach and we will definitely be back again. Thank you once again, this is a truly special place. Thanks for an amazing weekend of pure relaxation. What a perfect setting with the most stunning sea views! The cottage had everything we needed and was priced just right. We will definitely be back! We have stayed here a few times, and it seems to get better every stay. We had the most amazing weekend. Our cottage had the most spectacular view, and the braai area was so secluded from people and the wind. The hosts Colin and Lee are also so helpful and nothing seems too much for them. Thank you for our stay at Bretton Beach over the long weekend. As last time it was very enjoyable. We will most certainly visit again. 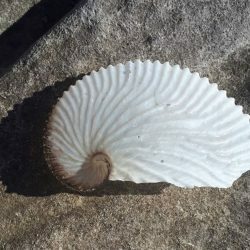 We were also lucky to pick up one of your scarce Nautilus shells – found it on the rocks to the right of Bretton (Kenton way) on the sharp corner. Thank you again for a lovely stay. We would just like to thank you for your excellent hospitality and friendly service during our stay at your cottage during the August long weekend. We really enjoyed it, and if the chance presents itself- would definitely stay there again, and also recommend it to other people.